It seems like there are more and more companies diving into the AR-15 market these days. This is great for consumers because we have more choices and competition drives each company to make sure they are making quality products for us at competitive prices. The problem comes with choosing which rifle to buy. 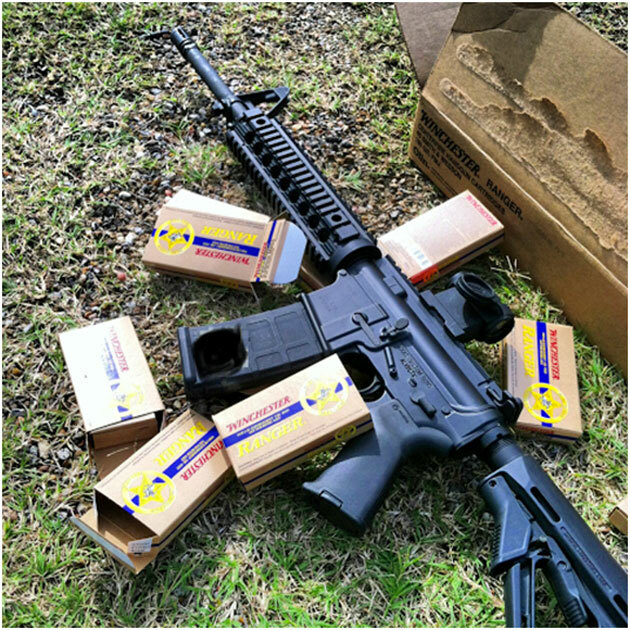 If you just need something for fun and plinking, just about any modern AR-15 style rifle will do. If you need a rifle to protect yourself and your loved ones though, you probably want something that meets or exceeds military specifications. You want something tough, reliable, and with great customer service and support. Sometimes with larger companies, getting someone to hear your voice when you have a problem can be trying. Texas Custom Guns is a very small company. Basicallyâ€¦ it’s just Lonnie. Heâ€™s a military veteran with a love for steel and things that go boom. His shop offers a wide variety of services including cerakoting, pistol-smithing, etc. The real lure of Texas Custom Guns though are the rifles. Lonnie builds each rifle himself and he makes sure they leave the shop right. Several weeks ago I had the pleasure of testing out two rifles from Texas Custom Guns. I am admittedly no gunsmith or weapons expert, but my profession requires that I have a rifle that is tough and reliable. Iâ€™m also really good at breaking things, so I was selected to test the rifles. Lonnie gave me two test guns with the simple instructions, â€œshoot them all you want. See if you can break them.â€ The first rifle was the TCG-15 and the second was a prototype of the Police Carbine. The TCG-15 is the flagship rifle at Texas Custom Guns. Available with different options, the gun I received was sporting a Magpul MOE stock, MOE+ pistol grip, and front and rear flip up sights. The barrel was a 16â€ with 1/7 twist and a YHM Phantom flash hider. Wrapped around the barrel was a free float rail made of 6061 aluminum hard coat, complete with anodized military standard 1913 rails. The tube style rail was lightweight and thin, but very strong, and included uninterrupted rails space along the top of the rifle and options to mount additional 1913 rails where you wanted them. Three free float design ensures that the rail does not contact the barrel and cause any shift in accuracy. I noticed that the bolt was NiB coated and was informed by Lonnie that he ensures that all his bolts are magnetic particle inspected and shot-peened. Many manufacturers will submit a random batch of their bolts for this test to ensure quality control. Only a few, like Texas Custom Guns, get every single one tested to make sure that no defective bolts make it out of the shop. The NiB coating gave the bolt a silver color and a very slick feel. It also made cleaning the bolt a little easier. Most of the residue and gunk that made its way on to the bolt was simply wiped off with a cloth. Texas Custom Guns rifle barrels are made from 4150 vanadium alloy milspec steel. I am no metallurgist and wonâ€™t pretend to know anything about different rifle barrel steels, but I do know that 4150 is generally considered by most to be a top quality steel for rifle barrels. It’s supposed to be tougher than the 4140 used by some companies due to higher carbon content. All I know personally is that I shot the gun a lot with no change in accuracy. TCG barrels are nitride treated inside and out, which offers increased surface hardness, corrosion resistance, and does not cause any degradation in barrel accuracy like chrome-lining can do. The TCG-15 upper and lower receivers are precision machined out of a solid block of aerospace grade 7025-T6 aluminum alloy. This is accomplished with the use of a 4 Axis CNC machine. The upper and lower receivers are then type III hard anodized to bring them to milspec standards. My initial testing started out on a 50 yard range, where I took the TCG-15 out to zero. The first thing I noticed was the feel of the CMC Flat Trigger that was installed on the rifle. 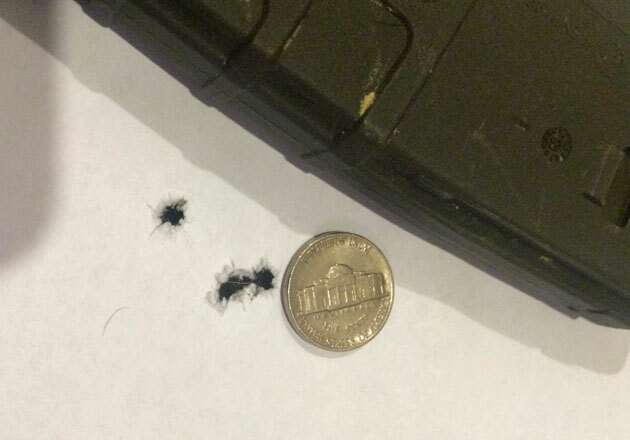 There was only the tiniest detectable movement in the trigger before it broke very cleanly. All of my duty rifles are equipped with standard GI triggers, so I really appreciated how light the CMC Flat Trigger felt. Although the flat trigger design may look a little funny to some at first, it allows for the pull of the trigger to feel exactly the same no matter how far up or down on the face of the trigger your finger rests. I really liked the consistency in trigger feel that I got out of having a flat trigger. 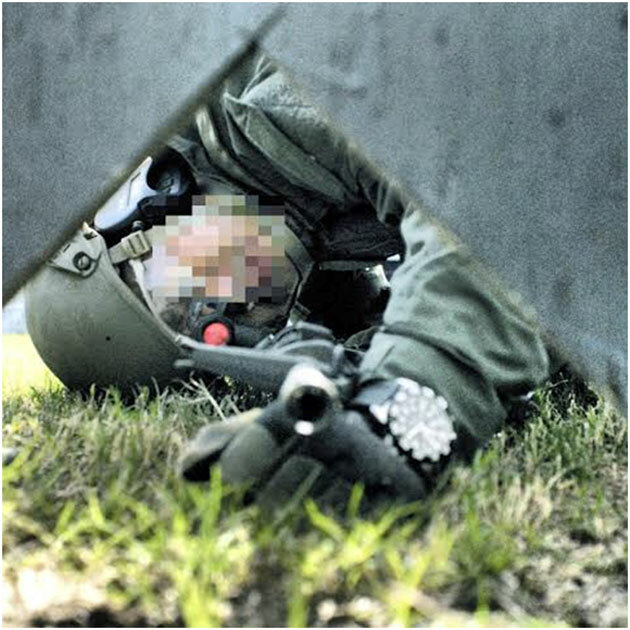 Several shooters training with us that day took turns firing rapid fire drills with the TCG-15. We began with controlled pairs and three shot strings, then moved up to 7 or 8 shot strings, depending on how fast the shooter was on the trigger. 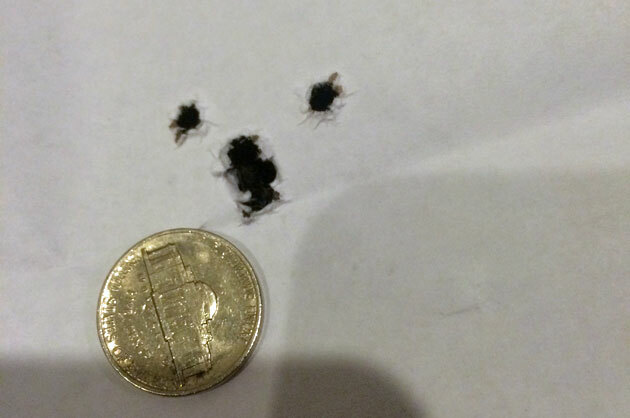 The recoil from the rifle was very light and made the gun easy to control and keep on target. The recoil I felt was about the same as my duty rifle, which makes sense since both the TCG-15 and my Noveske wear the same YHM Phantom flash hider. We did have one shooter complain about the recoil on the TCG-15. I later found out that his personal rifle is equipped with a BattleComp, making the recoil from the TCG-15 seem comparatively more violent, which of course is not really a fair assessment. I wanted to test the guns for accuracy but had to do it under less than ideal conditions.Â It was pretty windy on the only day I could make it out to the 100 yard range and the targets were actually moving slightly. It should also be noted that I’m no precision expert. Most of my training has been close-quarters and I am 100% positive that a better marksmen could’ve shot better 100 yard groups with these rifles. 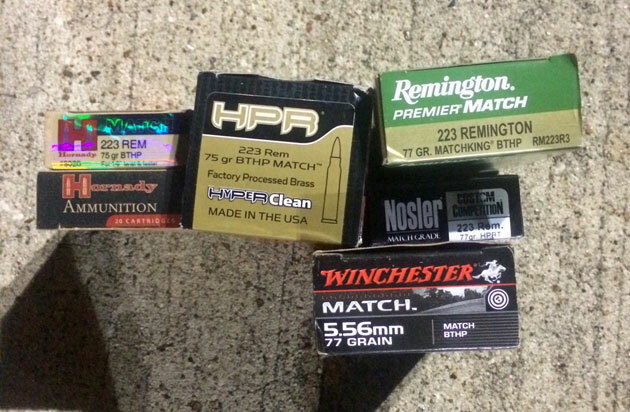 The rifles were tested with several brands of ammo shown here with the best groups of the day. 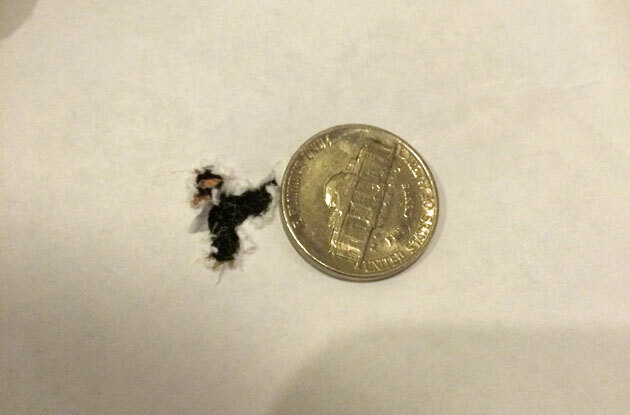 It isn’t difficult to put rounds in pretty much the same hole at 100 yards with the right ammo. Reload drills throughout the day were smooth. Lancer AWM magazines, Magpul Gen 2 and Gen 3 P-mags, and regular old GI magazines were fed into the TCG-15 without any problems. We put well over 1200 rounds through our test rifle and did not experience a single malfunction. Running the rifle through a shoot house for CQB training is where the TCG-15 really came alive. Our test rifle was equipped with a 16â€ barrel, which is a little long for some CQB applications. However, the gun handled incredibly well in tight quarters. The rifle is well balanced and lightweight making target transitions and navigating around corners and hallways fairly easy. The long hand guard provided ample space for me to get my support hand far out front, for those of you that like to shoot that way. Even after all the shooting and getting dragged around in the dirt, the action on the TCG-15 still felt incredibly slick thanks to the NiB coating on the bolt carrier group. The gun kept eating magazines and shooting accurately. 1200 rounds is not a torture test by any stretch, but everyone came away pretty impressed with the gun and no one had any issues with carrying a Texas Custom Guns rifle as a duty weapon. The TCG Police Carbine came about because Texas Custom Guns wanted to offer a rifle that was built tough enough for police or military use, without customers having to pay custom rifle prices. 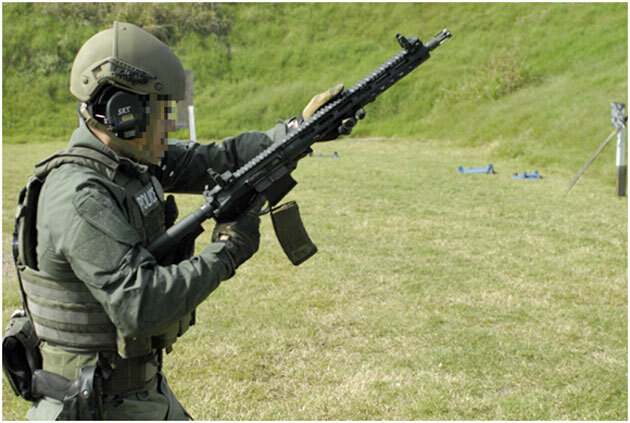 Most police departments run off of fairly tight budgets and may not be able to outfit their officers with something with all the bells and whistles of a TCG-15 rifle. The Texas Custom Guns Police Carbine is offered as a â€œbasicâ€ rifle that is a little easier on the wallet. Donâ€™t let the name fool you though, as the Police Carbine is not select fire and is available for anyone to buy if it’s legal for them to own an AR-15 rifle. At first glance, the Police Carbine looks like your standard run of the mill AR-15 that you can purchase at your local sporting goods store. The rifle comes standard with the familiar M4 plastic handguards and 4-position stock. The prototype that I tested came equipped with a Magpul stock and Midwest Industries rail, which are available upgrade options. The prototype also had a fixed front sight post and standard charging handle. What you might not notice right away is the â€œMicro Slickâ€ upper. Micro Slick is a coating made by Cerakote, and it’s a dry film coat that goes on in a very thin layer. The purpose of the coating is to reduce friction on many of the internal parts of a firearm. 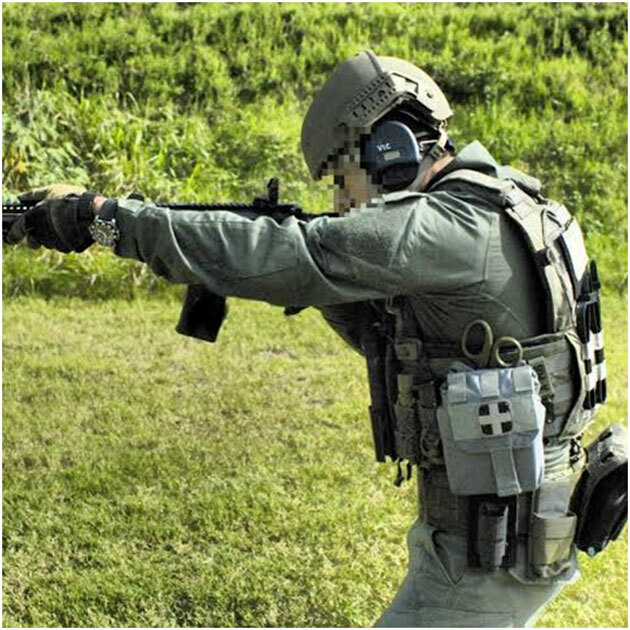 Micro Slick is becoming more and more popular among shooters for protecting small components in their guns. Pretty cool that it comes standard on the base model Police Carbine. Lonnie didnâ€™t skimp on the barrel either. My prototype came with a standard A2 flash-hider attached to a 16-inch barrel with 1:7 inch twist, with the same nitride treatment inside and out. 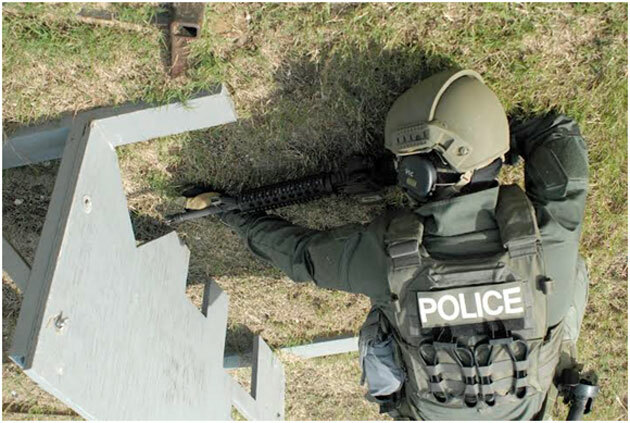 We took the carry handle off the Police Carbine and threw an Aimpoint optic on the gun, then subjected the Police Carbine to all the same shooting tests and drills as the TCG-15. 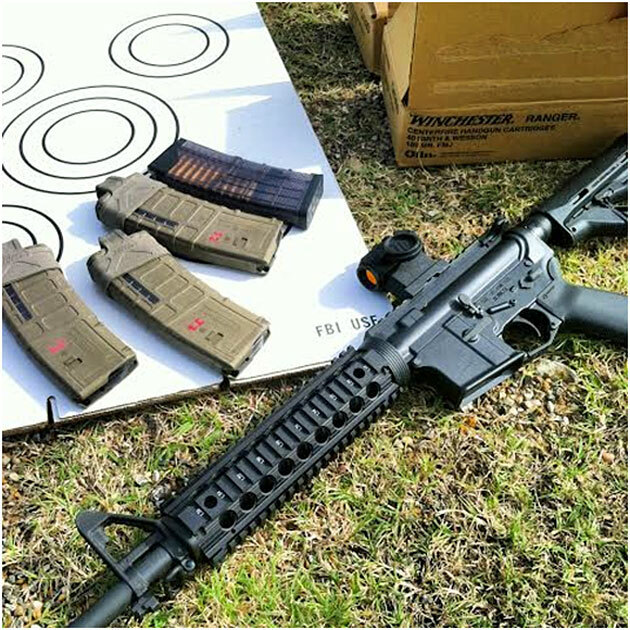 The standard GI trigger on the Police Carbine was not as crisp and clean as the CMC Flat Trigger found on the TCG-15, but it felt just as good as the triggers that came standard on my Daniel Defense and Noveske rifles. Although I really liked the feel of the CMC trigger, all my duty rifles have GI triggers and I have never felt the need to swap them out for anything better. Accuracy with the Police Carbine was great. 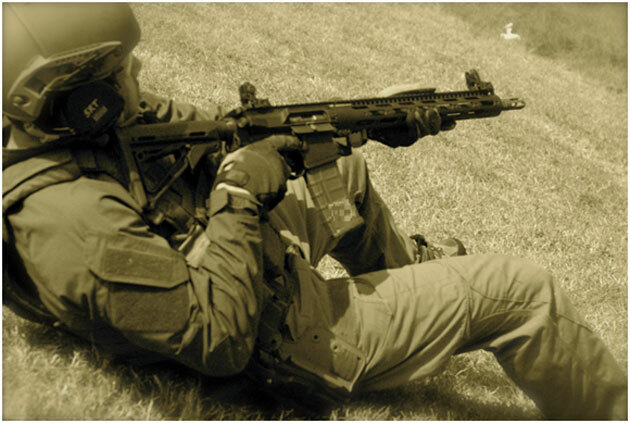 We had several rifles with us at this shoot including a Noveske, Daniel Defense, Spikeâ€™s Tactical, and Colt LE6920. The Police Carbine put rounds where I wanted to just as well as any of the other guns we had out there. 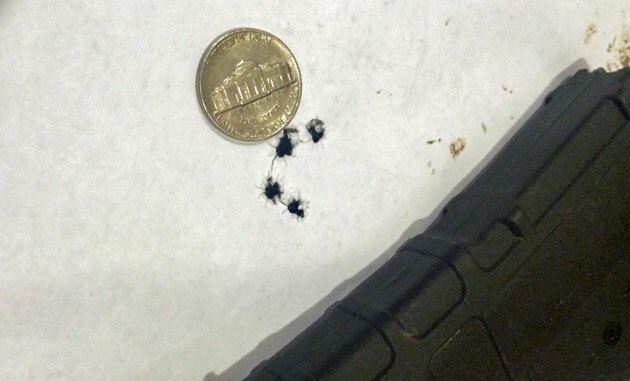 On the 100 yard range, the Police Carbine performed. I used the same ammo on the Police Carbine and here’s how it shot. Throughout the day the Police Carbine digested over 1000 rounds of ammunition. Just like the TCG-15, it was fed through steel GI mags, Gen 2 and Gen 3 P-Mags, and Lancer AWM mags. 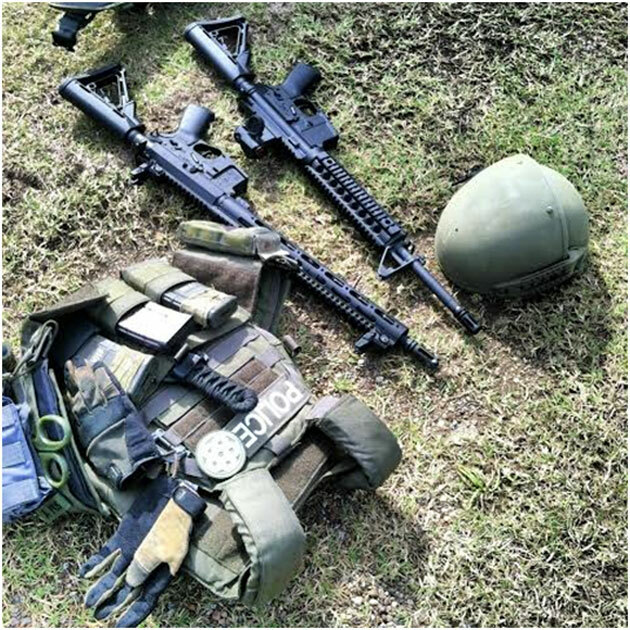 The Police Carbine did not experience any malfunctions throughout the entire range session. As a rifle coming in at almost half the price of the TCG-15, I was really impressed, as were all the other shooters present at the range. Probably the only thing I really felt needed changing on the gun was the standard charging handle. Iâ€™ve grown spoiled and accustomed to the Bravo Company Gunfighter Charging Handle, and I really missed it on the Police Carbine. At the time of this review, I believe Texas Custom Guns has already made minor adjustments and improvements to the Police Carbine. The prototype I got to play with was the â€œMark Iâ€ and I believe Lonnie went through a total of four revisions before bringing the rifle to the market. Texas Custom Guns has already landed contracts for Police Carbine rifles with several local police departments and I expect more will follow. It is a very solid shooting platform that is basic, but reliable. Plus you get a nitride treated barrel and Micro Slick upper, all at a very low price. Overall I think Texas Custom Guns is a small company that we can expect big things from. With the TCG-15 and the Police Carbine, Lonnie has shown that whether itâ€™s a fancy custom blaster or a bare bones, budget conscious carbine, he can hang with the big boys and put out reliable, duty worthy weapons. I look forward to seeing what other goodies come out of his shop in the near future.